It took me a few years–quite a few years, actually–before I came around to the idea of pairing sweet and savory foods together. Somehow, I always associated the mashup of sweet and savory with yucky Chinese dishes like sweet and sour pork, which I detest. 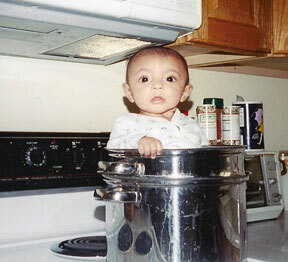 Maybe I just ate at too many mediocre Asian restaurants as a kid, I don’t know. I shouldn’t have been too averse, because growing up, I’d watch my father sprinkle salt onto his watermelon and eat it with relish. “You should try it,” he’d say, winking across the table. For years, I didn’t believe him and plus, this was the guy who both salted and peppered his morning slice of cantaloupe, so I figured the man was just a little off to start with. Until one day I tried it. I sprinkled a little salt onto a fat wedge of watermelon and…lo and behold. Daddy-o was onto something there. That smidgen of salt actually did make the watermelon taste better. That successful experiment opened me up to a whole realm of new possibilities. That strawberry, spinach and red onion salad I’d been rejecting all those years? Tried it. Liked it. Ditto the Chinese chicken salad with mandarin oranges in it. No way would I touch that thing as a kid, but once I started to grow and push those boundaries a little, I discovered that some sweet/savory combinations really worked. In high school, when we took a trip to the Bahamas, I tried my first taste of jerk chicken, topped with a cooling mango salsa. The icy sweetness of the salsa doused the tingling of the jerk spices in the nicest sort of way. In college, a trip to Hawaii resulted in a plate of ahi poke nachos, eaten poolside at a fancy Maui hotel. They were accentuated by a smoky chile and pineapple relish, and the contrast of textures and colors was a revelation. One blazing summer afternoon, some young girls visiting from Mexico introduced me to their favorite warm-weather snack: slices of chilled, sweet mango, drizzled with salt, lime and chile powder. How had I never heard of this before? During the blustery winter months, I never think of using fruit in my savory dishes, even though there are plenty of recipes out there using apples, pears, etc. Those recipes just don’t appeal to me. But once the weather turns and luscious summer fruit like plums, peaches, pineapple and watermelon begin appearing in market stalls, I’m in. 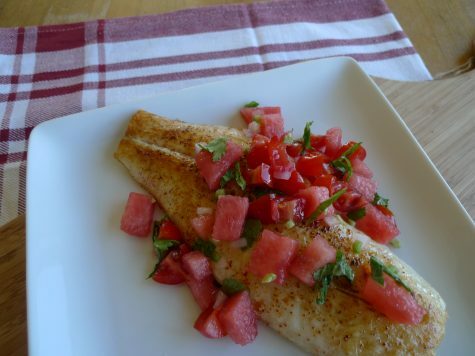 This recipe for snapper with watermelon salsa will have you in Summer Mode in no time. You can serve the fish simply, topped with the salsa and served with your choice of side dishes, or you can slide chunks of fish and salsa into a soft tortilla and top with avocado and lime, which is what I usually do. It’s easy enough for a weeknight but pretty enough for guests. It also makes a great addition to any potluck, since it doesn’t have to be screaming hot to taste good. Stir together the tomatoes, watermelon, red onion, chile, tequila, cilantro, mint, lime juice, 1 tablespoon canola oil and 1/4 teaspoon salt in a bowl. Set aside. Brush your grill grates really well. Grill needs to be very clean! Heat grill on high. 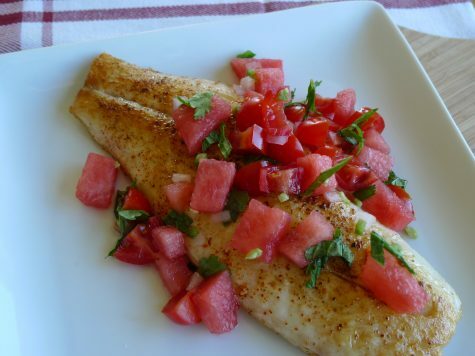 Brush fish with remaining 2 tablespoons oil and season with 1/4 teaspoons salt, Tajin seasoning and pepper. Place in a grill basket. Grill fish over direct high heat, turning once, with the lid closed, about 4-5 minutes total. Remove fish from grill, let rest for a few minutes, remove from grill basket. *If you don’t have a metal grill basket, you can cook fish in foil packets on the grill for about 5-7 minutes. I too was a late convert to the salty-sweet combination, but now I want to do the mango, lime, and chili powder over a piece of fish or similar ASAP for dinner because that sounds SO GOOD. Oh my gosh! This took me back! My father taught me to salt my watermelon, cantaloupe, and tomatoes. These days I only salt my tomatoes anymore. I take that back. I can’t eat raw stone fruits but I can eat them cooked. Last summer I tried an experiment… sliced peaches & nectarines, sprinkled with sea salt, and roasted on a baking sheet. I ate them all. Those roasted peaches and nectarines would be genius over vanilla/salted caramel gelato. Just sayin’. I adore watermelon. Unfortunately, so does everyone else in my house. I’ve never cared for salt on watermelon, but tomatoes? Absolutely. And coarse black pepper. Oh, my.